The record tells us that, after the collapse of the Soviet Union - for reasons entirely related to ice conditions and entirely to do with the breakdown of the route infrastructure - shipping along the route diminished but, we learn, between 1993 - 1997 the volume of sea cargo along the NSR was still 150 - 200 thousand tons a year. A new post-Soviet peak was established in 1993 when 15 Russian ships with 210 thousand tons of transit goods passed along the route. Now, there are even tourist trips. Also, eight ships carrying metals, fertilizers and timber travelled from ports in Russia, Latvia, Sweden and Finland to China, Japan, and Thailand. Seven ships from China carried oilcake, bauxite, magnetite and other operating supplies to Holland, England, Ireland, Germany, and Spain. So, how did the newspaper and its fellow travellers, such as the BBC, get it so wrong? For the genesis of error, we need to look to the hype at the start of this "epic moment", which involved two German-owned vessels, Beluga Fraternity and Beluga Foresight (pictured). Amongst the first conveying the misinformation was this, at the end of July, telling us that the the transit of these ships would be "the first time a vessel has crossed from Asia to Europe through the Arctic on a commercial passage." 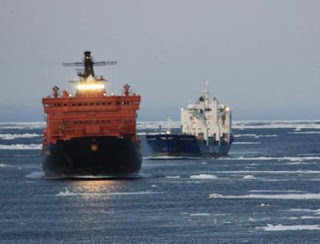 In August, though, Reuters was more circumspect, although it did lay the beginnings of the false trail, announcing: "Climate change opens Arctic route for German ships." "The melting of Arctic ice as a result of climate change has made it possible to send Beluga's multi-purpose heavy lift ships along the legendary Northeast Passage," we were informed, the agency citing as its source the chief executive of the Beluga Group, Niels Stolberg. Now, Stolberg is something of a devotee of the climate change religion, not least because he is at the forefront of fuel-saving developments, pioneered in the name of saving the planet. One of those is the "Sky Sail" – an enormous "kite-like sail" that was recently fitted to one of Stolberg's ships, funded, one discovers by the EU as part of its "Life" programme on climate change, to the tune of €1.2 million. Enthusiast for the new religion he might be, even Stolberg back in August did not make the bold claims that are being made now. He told Reuters that this was the first "non-Russian commercial vessel" cleared by the Russians through the route. That much was possibly true, but – as we know – there had over the years been substantial Russian commercial traffic. Thus did Reuters talk about German ships. In other words, this was a "first", but only for German, as opposed to Russian ships. By today, however, this has morphed into the Independent legend, that, "No commercial vessel has ever successfully travelled the North-east Passage ... Explorers throughout history have tried, and failed; some have died in the attempt," it warbles. In support of this fantasy, both the Independent and the BBC cite the 1553 expedition by Sir Hugh Willoughby, who died attempting to find the route. But neither of them tells us that the route was successfully navigated in 1879 by Adolf Erik Nordenskiöld who took his ship, the SS Vega, all the way through the passage from Europe to the Bering Strait. And conditions, it seems, were marginal. The two Beluga vessels had to be accompanied by at least one Russian nuclear ice-breaker during the whole of the trip. The two ships "encountered snow, fog, ice floes, and treacherous icebergs which showed only about one meter of their huge underwater volume on the sea's surface." Passing the northernmost point, the Vilkizi Strait on the tip of Siberia, half of the sea's surface was covered with pack ice and the captains of both vessels had to call Russian ice pilots on board to shepherd them through. Nevertheless, the story is just what the warmists wanted. Says Melanie Duchin, Arctic Expedition leader on board the Greenpeace ship Arctic Sunrise, "This is further proof that climate change is happening now." Predictably, she then adds that the development put greater pressure on world leaders to agree a major emissions cut at their Copenhagen meeting in December. "This is not a cause for celebration but cause for immediate action," she declared.